BAD DAD BAGGER EXHAUSTS Competition Series 2-into-1 Exhaust for 1995-2018 Street Glide, Road Glide, Road King, and Electra Glide project CHROME. Competition Series 2-into-1 Exhaust for 1995-2018 - 5.00 . Bad Dad's Competition Series 2-into-1 Exhaust is the perfect exhaust setup to give your project more style and more noise. This is a great exhaust option for your Street Glide, Road Glide, Road King, and Electra Glide project.. This custom pipe is CNC mandrel bent with 1-7/8" primary and 3" outlet. 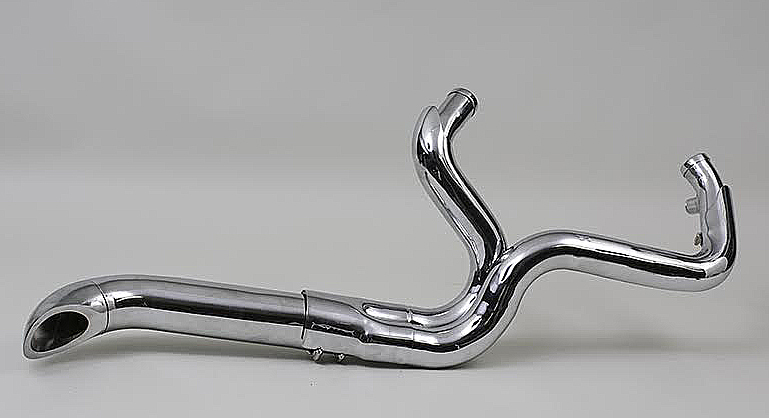 Available in three options: (1) entire pipe chromed or (2) entire pipe ceramic coated black, including the heat shields and CNC billet tip, or (3) contrast option with black header body and chrome heat shields & chrome tip. The custom tip is clocked every 45* so the tip can be adjusted up, down or out.. Available for 1995-2018 Touring models. This custom exhaust clears the stock air cleaner on 2014-2016 Touring models. Designed to reuse your original O2 sensors. Adapters for 18mm bung to 12mm bung conversions and extended O2 sensor wires are included for 2010-2016 models with the 12mm bung.. This is a performance exhaust and designed for off-road use only. Not intended for street use. Not available for sale or delivery to the state of California.. Performance: Add more than 10 horsepower to your bagger when installing Bad Dad's 2-into-1 Exhaust. An independent test by Baggers Magazine added 12 hp and 6 ft/lb of torque more than stock to their 2012 Road King's 103 c.i. engine when combining this exhaust system with an air cleaner and basic fuel tuner. ..